The growing awareness of the local folks in various aspects of community living, arts, traditions, culture, food and the uniqueness of such when shared to others, as always, became the basis for comparison as to what one place has to offer that the other cannot. Just like the seafood coming from Capiz an dhow it differ from other seafood sources or places in the rest of the country, makes one think who's got the better produce and who deserves to be labeled as the "seafood capital of the Philippines". By far, Capiz Province has been identified and officially tagged as the country's seafood haven by five national agencies. In the early 1980's, the Department of Agriculture (DA - where the Bureau of Fisheries belongs) and the Department of Trade and Industry (DTI) were the first to declare Capiz as the "seafood capital" of the Philippines. This was followed by the Department of Environment and Natural Resources (DENR), then the Department of Agrarian Reform (DAR), even by the Department of Transportation and Communication (DOTC) (then - editor). Citing the low incidences of the "red tide" scare in the waters of Capiz since its onset in the 1980's, the presence of the so called "brackish waters" in bigger areas (the kind of water combination of fresh and salty where most species thrive) and the fact that we supply almost 60% of the fish requirement of Divisoria, are reasons enough to justify such national image. 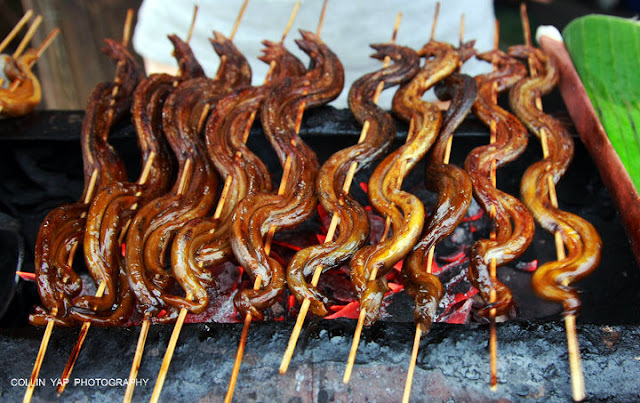 Another development in the ocurse of sustaining the "seafood capital" image of Capiz in the country is the discovery of an abundant "sea eel like" sea dwellers found in the brackish waters of the municipality of President Roxas. Locally called as "Poyoy", this "Brackish Eel" (English name) which is the smaller version of the sea eel, usually thrive in brackish waters as its name indicates. Poyoy is a priced sea catch as it is easily sold, as it is reasonably priced, which is a native favorite dish of the locals and sought-after "chews" by street food lovers and amongst passer-bys including those who finds it best when served as "pulutan" in a drinking spree. Usually cooked after being marinated with flour and seasoning, the "Poyoy" is either cut into pieces and deep fried in a boiling oil or directly pierced in bamboo sticks, cooked in a firy charcoal and lavishly brushed with mixed flavorings of vinegar, soy sauce, kalamansi and spices. The taste and smell is so good, one cannot help but try one more than as expected, particularly for first timers. The name "poyoy" may sound funny, but mind you, could be one Capiz' exotic seafood in the days to come and the town of President Roxas would have it first.